Thanks to my Pocket PCRef, I know that the above drive is a 5.25 inch half height (which is to say, the same height as a modern optical drive) ST-506 3600RPM unit which reported 5 heads, 1024 cylinders and 17 sectors per track. This information is, of course, almost perfectly useless these days, as is most of the rest of the content of even the current edition of Pocket PCRef (mine's the 1999 ninth edition). Connector pinouts and ASCII codes and such are all very well, but it's not as if all of those aren't at your fingertips anyway if you've got an Internet connection. The same goes for keyboard scan codes, paper sizes, number base conversion tables and error beep codes for various old BIOSes - though if you work with PC hardware every day, a Pocket PCRef will still probably help you out a few times a year. More impressive is the original Pocket Ref, old editions of which are far less obsolete. Pocket Ref has close to nothing about computers in it. It's more about every single piece of basic engineering information you'd need to reconstruct society after the inevitable happens, all in a very literally pocket-sized book. Apropos my previous post about file hosting services, the perfect repository for at least some big files occurred to me. 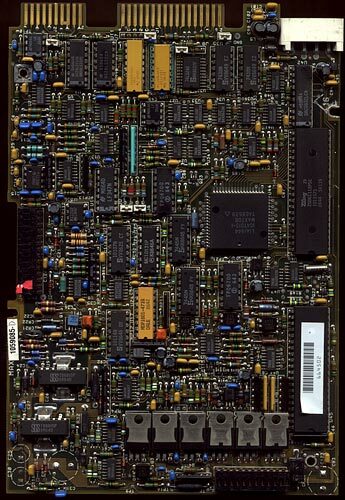 It's a 1200dpi scan of a 5.25 inch hard drive controller board, from this scanner review from almost eight years ago. 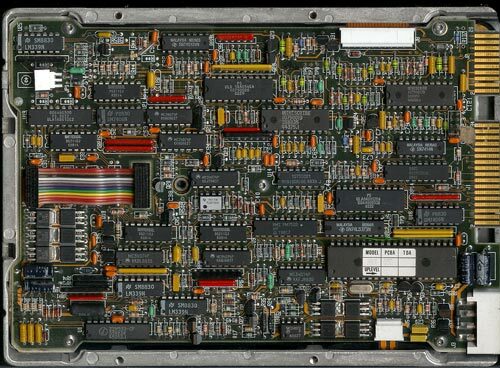 The board is of course rather older than that; it's from the days before surface mount (OK, nitpickers, before everything was surface mount), when electronics took up more room and looked much cooler. That cheap little scanner did a quite commendable job. Not quite 1200 whole dots per inch of detail, but still a whole lot of it in this 66 megapixel (!) image. Which ought to be quite enough for anybody's desktop wallpaper. If you've got some giant image, sound or video file that meets Wikimedia's rather loose requirements, you can upload it to the Commons and be reasonably sure that it'll be speedily available to the world for the foreseeable future. The one caveat, of course, is that uploaded content must be covered by one or another free-use license. That rules Commons out for the 1337 w4r3z and pr0n that comprise most of the data uploaded to file-dump sites, unless you expend an unreasonable amount of effort in hiding your pirated content in something legit, and then hope they don't notice that myadorablekitten.jpg is 702Mb in size. There are various other stock photo repositories out there; Morguefile is a good one, and you can share big images on Flickr as well if you pay for an account (otherwise the biggest dimension of your pictures is limited to 1024 pixels). I thought I'd stick with the big guns for this image, though, because it's 12 freakin' megabytes. Uploading your backups to FTP sites may be the really studly way to do it, but for this one niche - unreasonably large pictures of things that belong to you - Wikimedia looks pretty cool. I hope to see many more scans of improbable objects there in the near future. Actually, that's unfair. Jevnikar's stuff, much more of which you can see on his site, is not nearly that hideous. There's not a Chick Riding A Reptile to be seen (see also). He does seem to have a thing for pyramids, ringed planets, force fields and craggy mountains, though. Fair enough; so do the cover artists for the books which I, like Gabe, favour.